Who killed professor Abby Monroe?When Kellan Ayrwick returns home for his father’s retirement, he finds a dead body in Diamond Hall’s stairwell. Unfortunately, Kellan has a connection to the victim, and so do several members of his family. 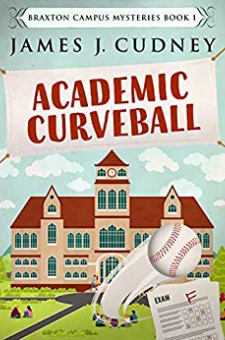 Soon after, the college's athletic program receives mysterious donations, a nasty blog denounces his father and someone attempts to change students' grades.Someone is playing games on campus, but none of the facts add up.With the help of his eccentric and trouble-making nana, Kellan tries to stay out of the sheriff’s way. But who is behind the murder?Praise from readers:????? - "Fantastic writing and witty dialogue... Awesome."????? - "An exciting cozy mystery."????? - "Full of twists and turns, and an ending you won't see coming."